To order a printed copy of the Build Your Own Conservatory - ConservatoryLand catalogue, simply click the Request button below. Self–Assembly – Its Easier Than You Think! Conservatories date back as far as the 15th century when they were known as Orangeries and were used to grow luscious fruit. Today they are the perfect home improvement. Imagine a room with light, space and warmth, a room that could transform your home. With ConservatoryLand its easier than you think and costs less than you expect. We manufacture quality PVCu conservatories for fast and easy self–assembly with prices starting at just £1495. 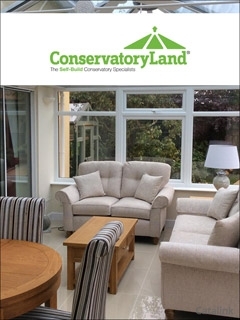 You'll save £1000's at ConservatoryLand – A conservatory that will exceed your expectations, made–to–measure, delivered to your door direct from the manufacturer and complete with a full fixing kit, easy–to–follow assembly instructions, a 10 year guarantee and first–class technical support only a phone call away. Its easy and anyone can do it, We'll show you how! The confidence you need from the ultimate showroom. ConservatoryLand have real–life customers and conservatory installations in almost every region of the UK, mainland and offshore. The country is our showroom, just ask us for a viewing. Want to know more? Send for your free colour brochure now and you'll see just how easy it is to save £1000's by building your own conservatory with ConservatoryLand, the self–assembly conservatory experts! Build Your Own Conservatory - ConservatoryLand Catalogue Melanie D. said: Very prompt response. Build Your Own Conservatory - ConservatoryLand Catalogue Rosamond M. said: Catalogue was informative but I decided the product was not something I needed and therefore I did not want to make a purchas. Superb steel windows and rooflights from Clement Windows. Receive the best possible service from enquiry to fitting with a window construction and steel frame fitting service that comes second to none. By pressing the Request Printed Catalogue button you give consent to Build Your Own Conservatory - ConservatoryLand (and their Data Processors for the specific purpose of delivering your literature) to send you their Catalogue.